International freight forwarding and logistics company Panalpina preserved profitability in the first quarter of 2016 despite the continued contraction of the global oil and gas business. Panalpina reported an EBIT of CHF 24.0 million (Q1 2015: CHF 25.3 million) and a consolidated profit of CHF 17.3 million (Q1 2015: CHF 19.6 million). In a continuously soft market, transport volumes grew in Air Freight but decreased in Ocean Freight. Logistics reported the fifth positive consecutive quarter on EBIT level. Group gross profit decreased by 2% to CHF 364.9 million (Q1 2015: CHF 371.8 million), while total operating expenses were reduced by CHF 4.3 million to CHF 328.7 million (Q1 2015: CHF 333.0 million) year-on-year. Panalpina achieved an EBIT of CHF 24.0 million (Q1 2015: CHF 25.3 million), a decrease of 5% compared to last year’s first quarter. The EBIT-to-gross-profit margin came in at 6.6% (Q1 2015: 6.8%). 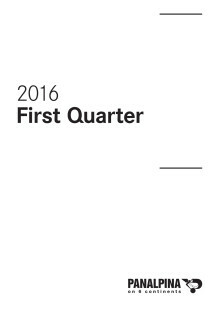 The consolidated profit of the group reached CHF 17.3 million (Q1 2015: CHF 19.6 million). Panalpina generated a free cash flow of CHF 44.7 million in the first quarter, up from CHF 27.5 million a year ago. 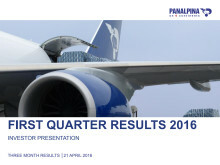 Panalpina’s Air Freight volumes grew 5% in the first quarter, in a market that shrank by an estimated 3%. While volumes contracted substantially in oil and gas they grew in all other industries including perishables. Gross profit per ton decreased 5% to CHF 688 (Q1 2015: CHF 722), but gross profit overall remained unchanged at CHF 148.6 million (Q1 2015: CHF 148.0 million). 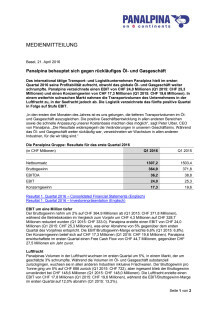 Air Freight achieved an EBIT of CHF 17.8 million (Q1 2015: CHF 19.6 million), and the EBIT-to-gross-profit margin for the first quarter decreased to 12.0% (Q1 2015: 13.2%). Significantly lower volumes in oil and gas and a discontinued high-volume contract meant that Panalpina’s Ocean Freight volumes decreased 10% year-on-year while the market shrank by an estimated 1%. However, gross profit per TEU increased 10% to CHF 339 (Q1 2015: CHF 308), resulting in a stable gross profit of CHF 118.1 million (Q1 2015: CHF 119.1 million). EBIT and EBIT-to-gross profit margin remained stable with CHF 4.3 million (Q1 2015: CHF 4.5 million) and 3.7% respectively (Q1 2015: 3.8%). 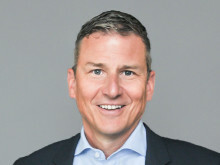 The company’s continued exit from underperforming sites meant that the gross profit of the Group’s Logistics product decreased 6% to CHF 98.2 million (Q1 2015: CHF 104.7 million), but EBIT increased from CHF 1.2 million to CHF 1.8 million. The Panalpina Group operates a global network with some 500 offices in more than 75 countries, and it works with partner companies in a further 90 countries. Panalpina employs 15,000 people worldwide who deliver a comprehensive service to the highest quality standards – wherever and whenever.